Hi everyone! I’m so excited to be part of the Essentials by Ellen October 2017 release blog hop as a guest designer! If you’ve been hopping along with us, you should have arrived here from Ellen Hutson’s blog, The CLASSroom. Today, I’m featuring the newest Cozy Lady stamp set designed by Brandi Kincaid. I’ve created two cards with this set to show you how versatile the stamps are! For the first card, I created a top-folded card base with white cardstock. I then die cut the Stitched Lawn Fawn Woodgrain Backdrop from kraft cardstock and adhered it to the card base with adhesive tape. It gives a nice textured background but still keeps it clean and simple. I stamped the Cozy Lady in black ink. As you can see, on my card, she holds a book but not on the stamp. I used the masking technique to create this "new" image. I first stamped the book, masked it (using stamping mask paper) and then stamped the lady. I removed the mask, colored the image and cut it out. I also stamped the two sentiments on white cardstock and cut around to create self-made speech bubbles. Next, I created the rug. I cut a small oval shape from white scrap paper and glued Twine on top using Ranger Multi Medium Matte glue. I then glued the rug to the card base. To finish off my card, I adhered the Cozy Lady and the speech bubble with foam squares for more dimension. I also added a cute little leaf in her hair. For the second card, I went for a fall still life arrangement with apples, leaves and a pumpkin. I created a top-folded card base from white cardstock and sponged the center with blue Distress inks using a blending tool. I cut a strip from kraft cardstock and sponged the edges with brown Distress inks for more depth. I stamped the "Just a note" in black ink. The sentiment is from the Essentials by Ellen Fancy Thanks by Julie Ebersole. I adhered the label to the card base using foam squares. I added a piece of patterned paper to make it look like a tablecloth. The paper is from the Summertime paper pad from Penny Black. Next, I stamped all images (basket, apples, leaves, pumpkin) in black ink, colored them and cut them using scissors. I used stamping mask paper to create the basket with apples inside. I adhered them to the card base with foam squares for more dimension. As you can see, these little stamps that are part of the set are so beautiful and really versatile. 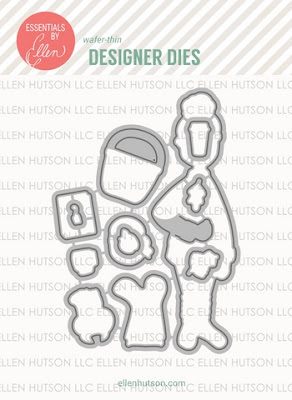 You can find all new stamps and dies from the Essentials by Ellen October release in the Ellen Hutson online store HERE. That’s all for me today! Thanks so much for joining us today and happy hopping! oh so ADORABLE. Love both of your cards! Awesome coloring! I love that background die too! The still life you created is charming. It reminds me of apple picking, crisp autumn days, and my favorite fruits just waiting for being baked into pies. 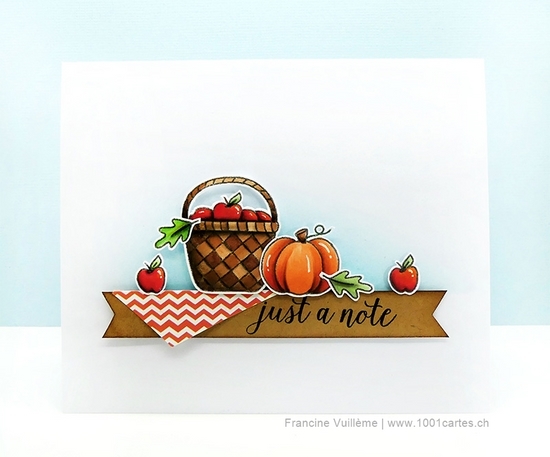 What a perfect stamp set for fall! These are two great cards ! Love your cards. Your coloring is awesome. Fabulous cards. Great coloring. Love the background and the rug on the first one. Your cards are terrific! I love your rug addition on the first card. So clever. Your coloring is perfection on both cards. Well done! Your cards are wonderful! I really like the masking on Cozy Lady and that rug! Awesome! Two very cute cards. There is something about the look on the lady's face that is so appealing. Creating the little rug from the twine (on top of the wood-grain embossing) is AWESOME! Love your comfy card, as well as the harvest one. The little triangle of "tablecloth" is also inspired. All about the textiles, right? 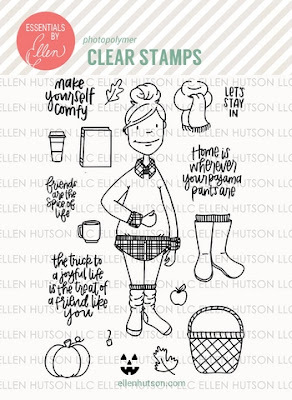 This stamp set is awesome and I love how you made her with a book wanting to be cozy and read! You were very clever when you made the adorable rag rug! Thanks so much. I love the wood grain die background with the Cozy Lady. It really pulled my eyes to her but then on to the Background too. It's a great card for welcoming guests to make themselves at home. The other wonderful card reminded me of what my mom always called a bread and butter note. They're both so cute!